Late afternoon at the fishing pier. Osprey on the light post. Cormorant on the light post. A great blue heron on the light post. I saw two birds that were hooked on fishing lines. Both were pulled up and released. The top one was a cormorant with line wrapped around his foot. The 2nd was a snowy egret that got a hook caught in his feathers. Everyone helped out and both had the lines taken off and released. The birds were very calm while the people were taking the lines off. The sun was going down on the dolphins and birds. A beautiful sunset walk at Fort Desoto. A sad picture but happy ending. 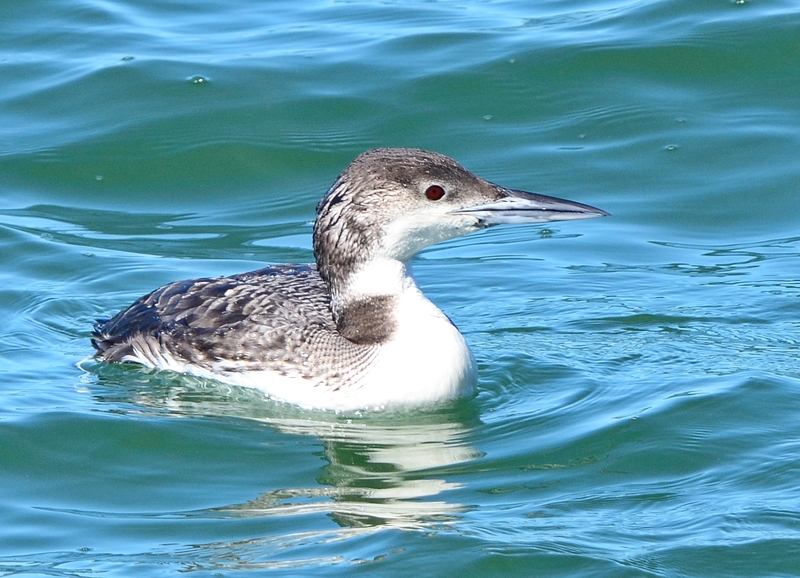 These beautiful loons only stay in Florida for a few short months during the winter. I caught one busy getting his own fish. He was gulping them down, one after another. Then the below happened. 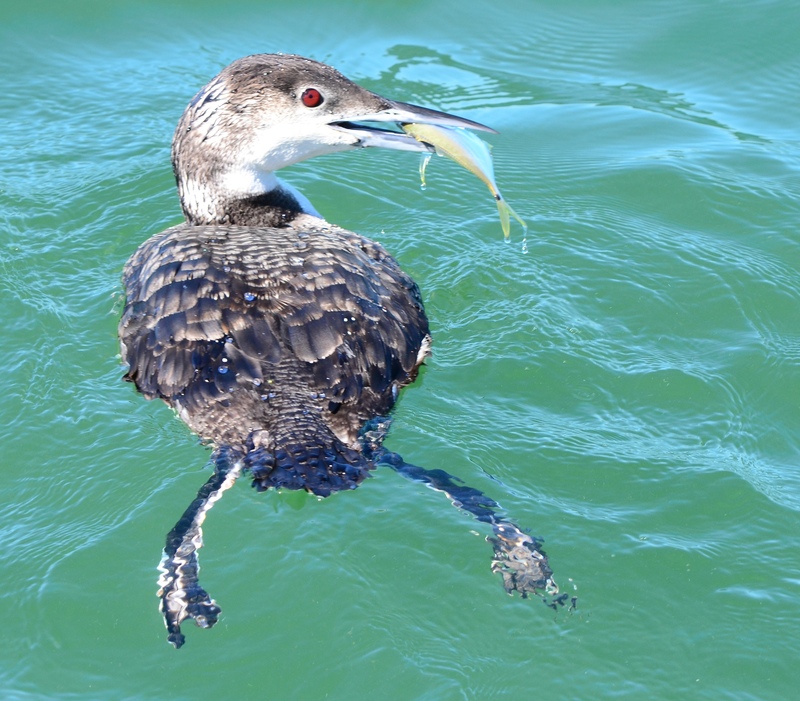 A loon had gotten caught in fishing hook and the fisherman was pulling him up on the pier. At least the fisherman next to him had told him not to cut the line, to pull him up and get the hook out. It’s better to use a bait net but they pulled him so fast no one had time to get the net. I ran over to the corner and shot the above quick right before he came up on the pier. A volunteer from the Tampa Audubon was there and helped get the hook out. 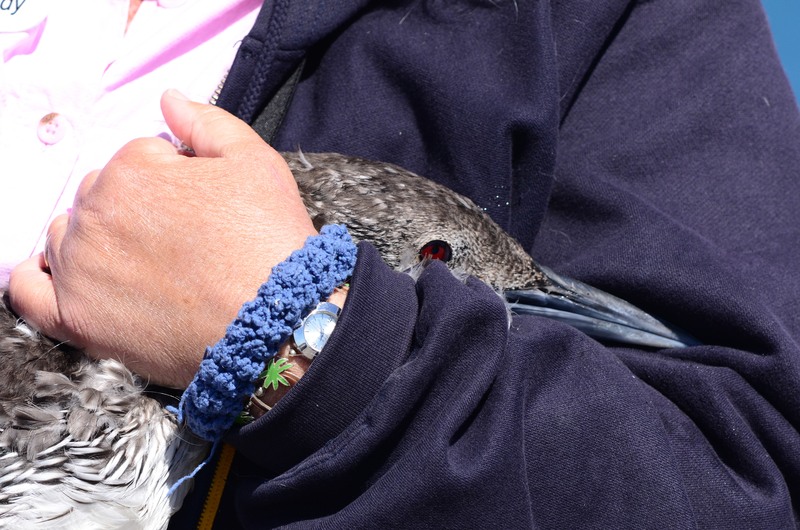 The hook came out quick and the loon was released back into the water. This pelican was not so fortunate. He has fishing line stuck somewhere on his body. He was on the other side of the pier that is not accessible. A few other sights on the pier that morning. And we wonder why they just cut the line instead of pulling up the bird. They can’t even bother to pull up their own pants. If you missed the story the Tampa Bay Times posted on this issue that I attached in my last post, here is the link again. This not new news. I found this article from 2010 about the same subject. Hubby and I stopped by the Sunshine Skyway fishing pier to look for the rare kittiwake that had been sighted there earlier that week. We looked, along with several other birders, for over an hour with no luck. I did get a lot of “birds in flight” practice that morning. 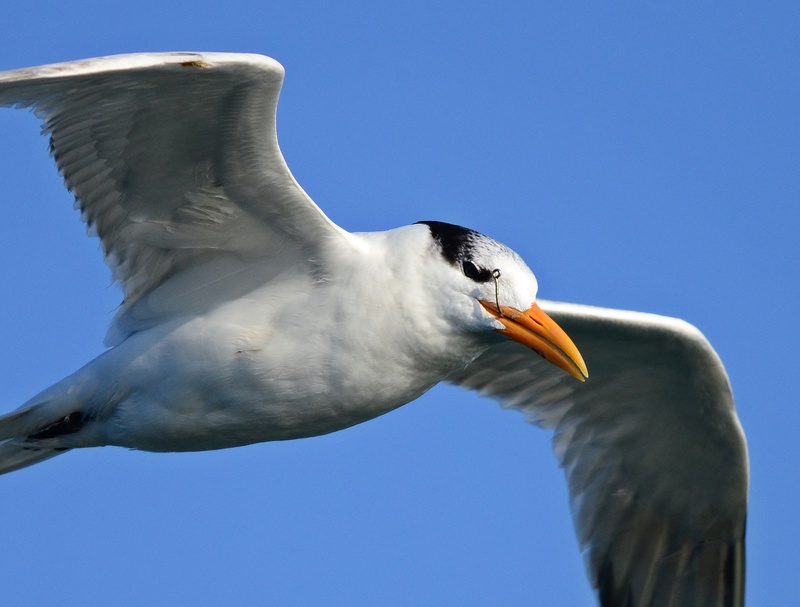 I realized after I cropped this up that the royal tern had a hook in his beak. This was a common sight around the pier. 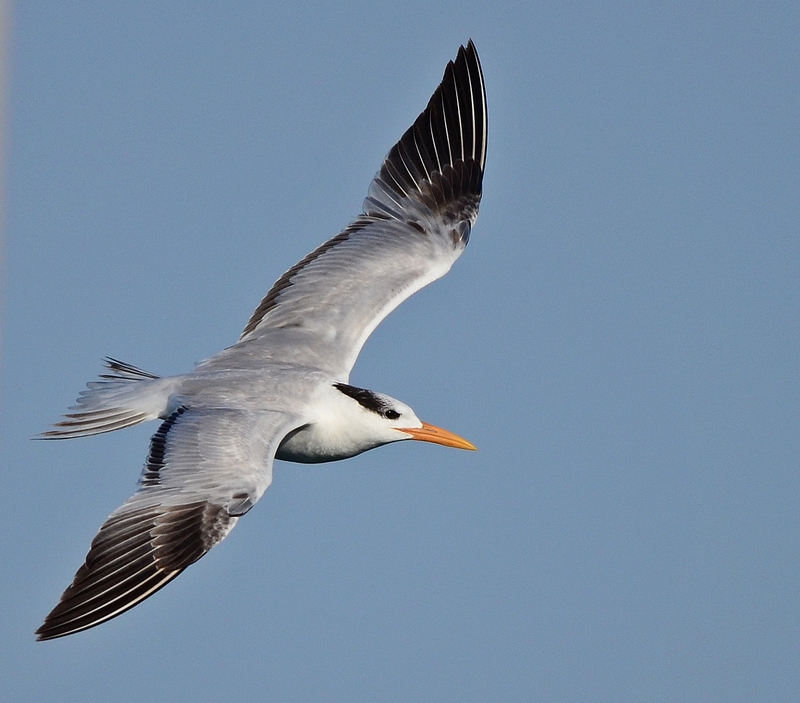 I saw another royal tern on the other side of the pier with a hook pulling on his skin. He was trying to swallow a big fish. 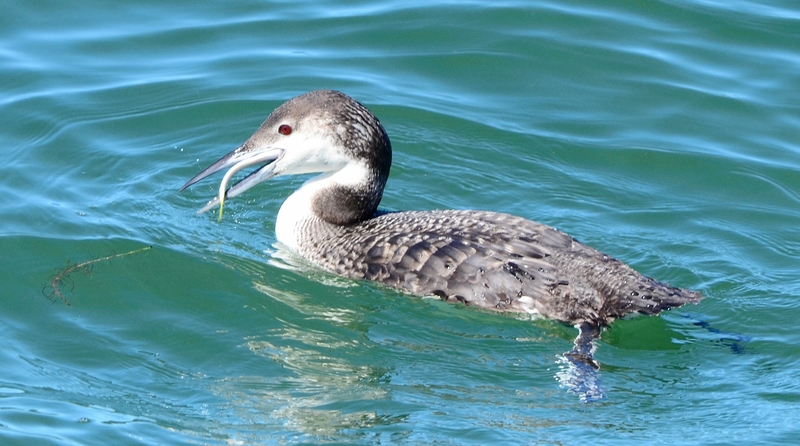 He got the fish down but not without doing more damage to the beak area. I’m not sure how someone would be able to catch this one. He was flying pretty good and stayed on the other side of the pier that you can’t get to. 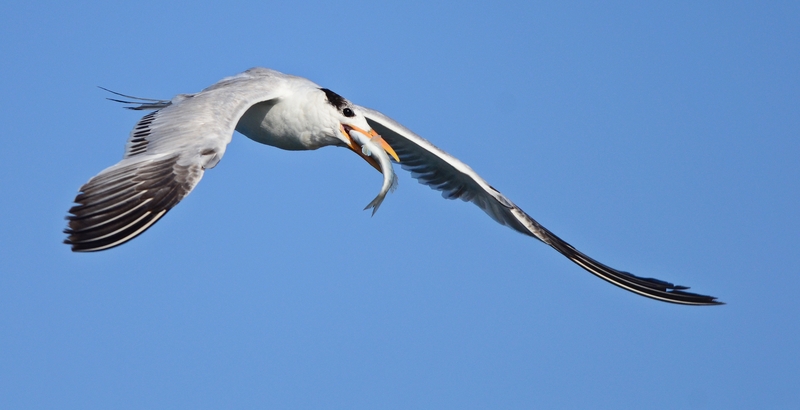 Another royal tern with a fish. He flew right over my head. No hooks here. 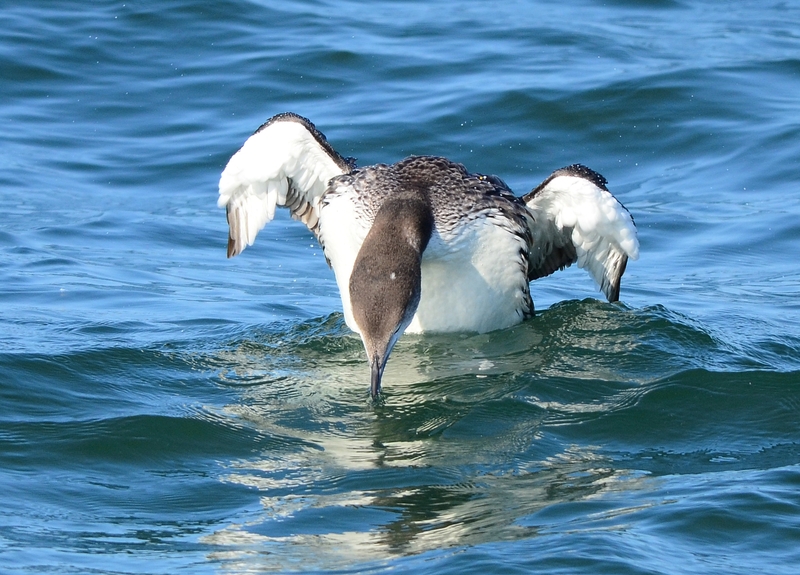 This common loon has a hook in it’s beak. 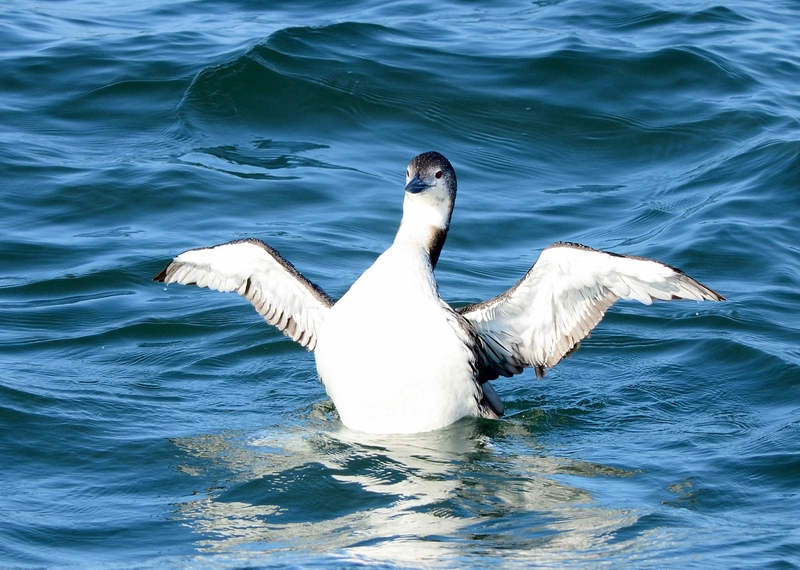 This loon was showing off. 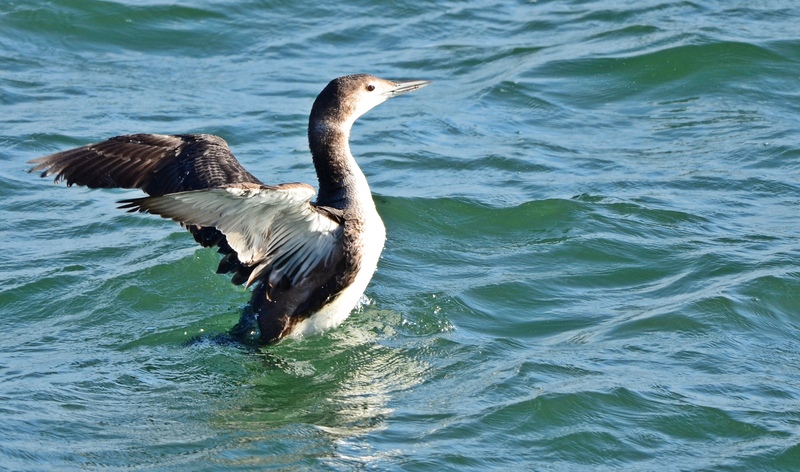 This has been a banner winter for loons in the Tampa bay area. We only get them in the winter here around Tampa and last winter I only saw 2. Back down for another fish. 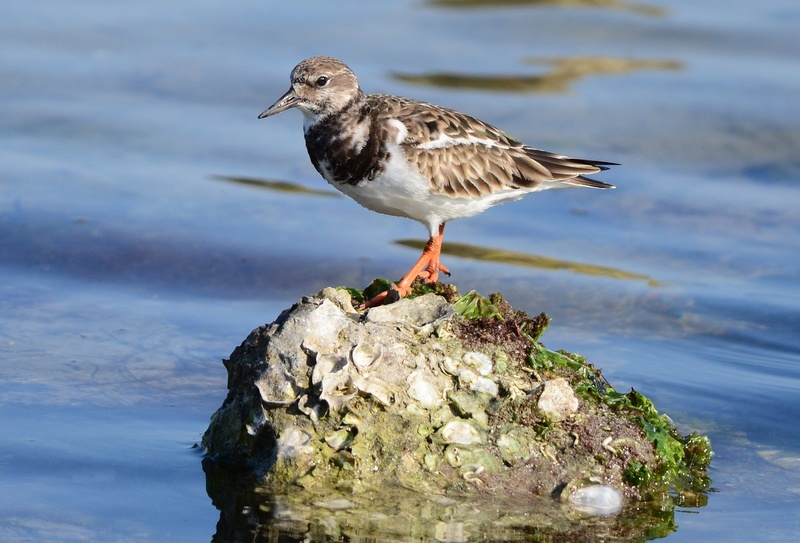 Ruddy turnstone posing on an oyster bed. A view of the Sunshine Skyway bridge from the rest stop. 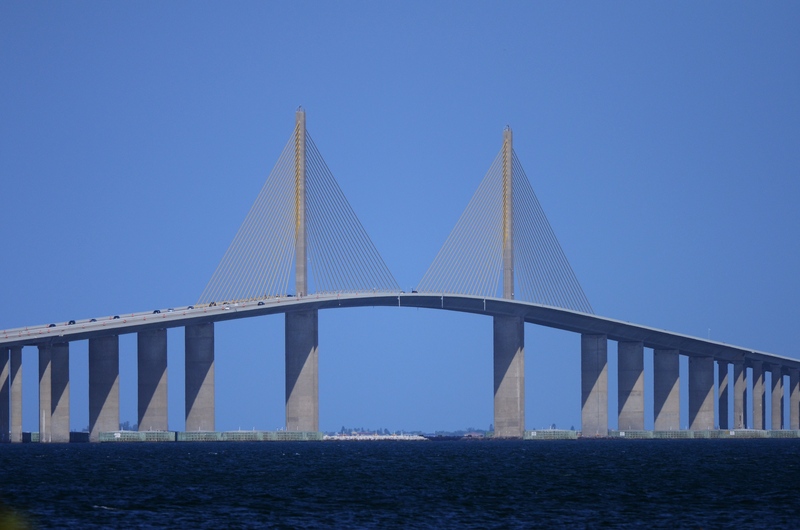 The bridge takes you from St. Petersburg over the bay to Sarasota and south Florida. This new bridge opened in 1985 after a freighter crashed into the old one doing enough damage to close it down back in 1980. Part of the old bridge is still used as a fishing pier. The couple of times that I’ve been out on the fishing pier, it has been packed with people fishing. 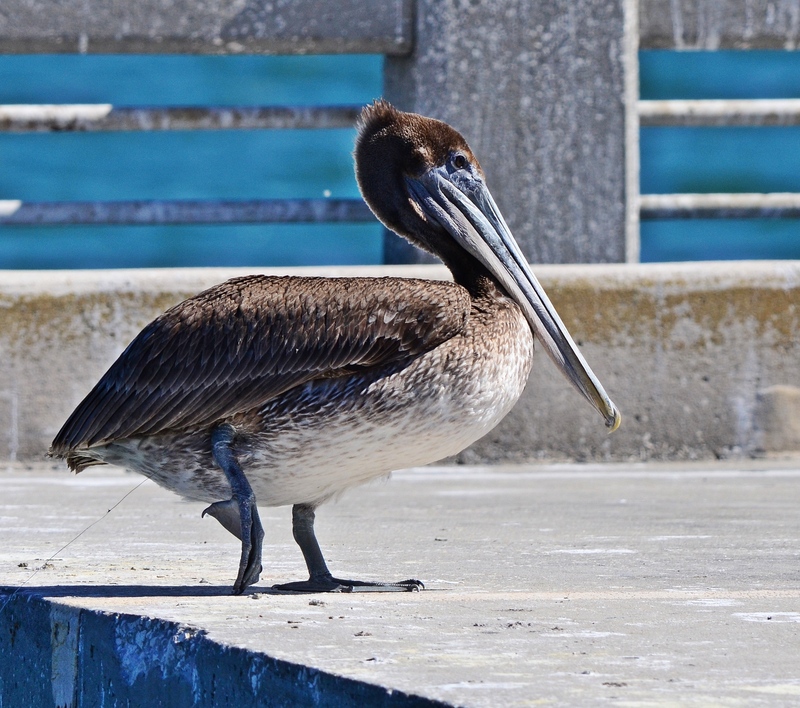 The birds, including gulls, terns and pelicans, hang out here to fish as well. They also like to steal the bait fish from the fisherman. 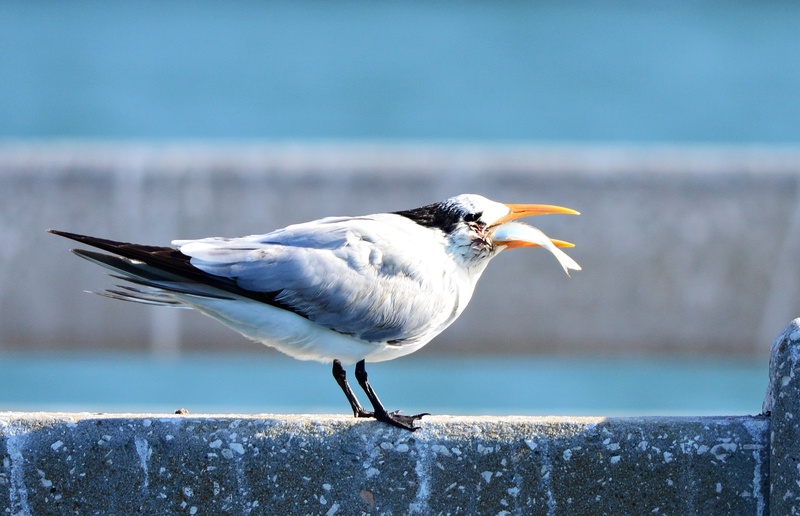 The biggest problem is that the birds will go after a fish that is already on a hook and the birds get hooked too. There are educational boards all over the fishing pier with instructions on how to reel in a hooked bird and take the hook out. It is clear to never cut the line. 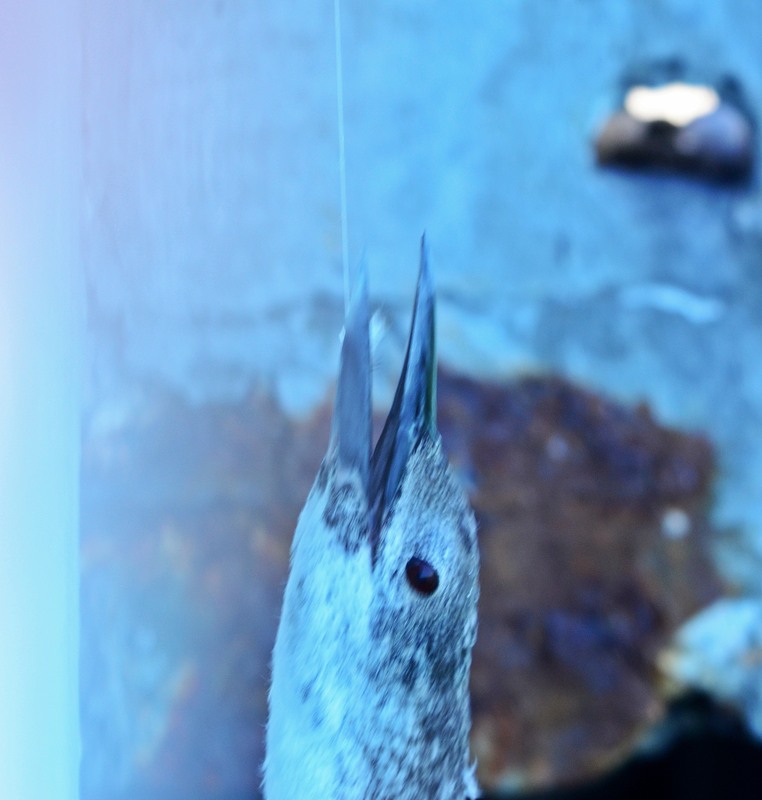 The bird will die with a hook and fishing line trailing behind it. After spending time on the pier, you will get the impression that most people don’t care and will just cut the line. I say most because there are a few people out there with a soul and will help release the bird the right way. With the amount of birds flying around with hooks, most just cut the line. The local bird rescue and rehab company has been having financial problems and has stopped taking in injured birds. A new group of volunteers are working on starting up a new rescue group. 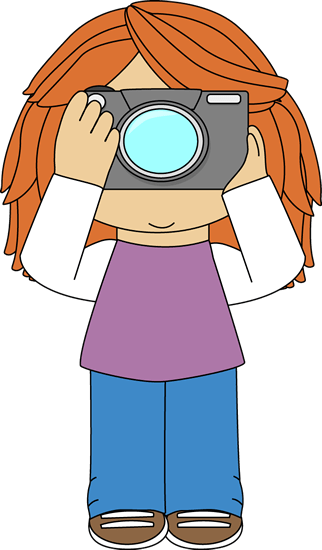 With all of the birders out on this pier recently looking for the kittiwake, there’s been a growing concern on how to help out at the pier. There’s so much more to this story. I’ll save that for a later date. I still stand behind my thought “No fishing should be allowed on fishing piers.” Like that would ever happen in Florida.